Enthusiastic community members got their hands dirty this week at Burlong Pool for a tree planting day coordinated by the Avon Catchment Council (ACC). The day was a great success with 1500 trees planted by all participants who thoroughly enjoyed helping with the revegetation of Burlong Pool. Local Aboriginal and community members, Avon Valley Environmental Society, Department of Water and the Green Corps team all took part in the day’s planting, which was followed by a BBQ lunch. A film crew from Murdoch University also recorded the day’s activities as part of the ACC’s Recording of Traditional Knowledge project. ‘It was great to see people from the Northam community, including the local Ballardong Nyungar community come together and play a role in re-planting of Burlong Pool’ said Nathan Heal. ‘I also think we witnessed the next generation of conservationists with so many children keen to get involved’ he said. The Avon Catchment Council has partnered with the Department of Water to undertake environmental works to restore what was once a large and very deep expanse of water at Burlong Pool. Burlong Pool is a semi-permanent body of water located on the Avon River in the Shire of Northam and is an important site to the Nyungar people. It is at present being managed and developed through consultation with the local Aboriginal community. The Department of Water has partnered with Mission Australia to host a Green Corps team based at the Avon Valley Youth services building who are undertaking works at the Pool amongst other sites. The team played a major role in the days planting activities and have been working closely with all partners to undertake the works at Burlong Pool. 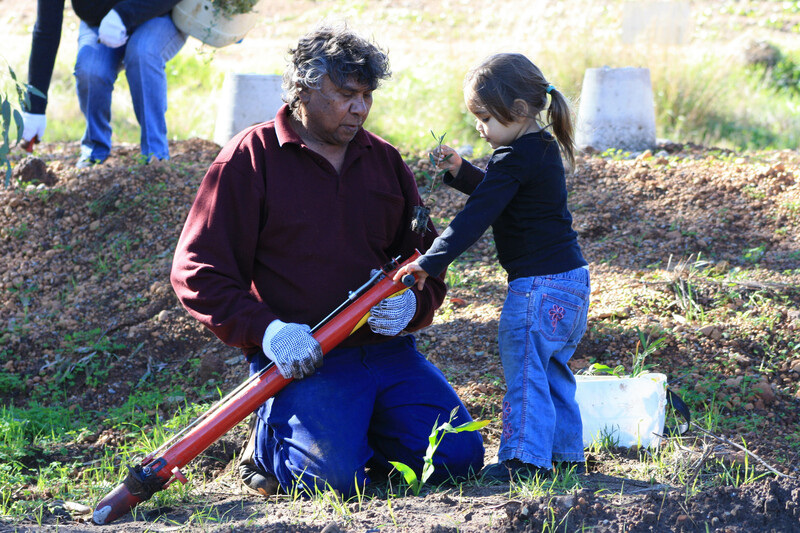 Media contact: Nathan Heal, Aboriginal NRM Officer Avon Catchment Council 9690 2250 Photo caption: Gary Bennell and his granddaughter help in planting seedlings at Burlong Pool.